Senyorita Lakwachera: Boracay, a fantasy to reality vacation. Boracay, a fantasy to reality vacation. I haven’t known Boracay until my high school days and that time it was never in my mind not even in my dreams to reach this place. When I started having my own wing and strength to fly my own this wasn’t in the list of my destination, but time had gone and a plan to travel started to run on my mind; in love for ruins and arts of ages I started planning a trip to one of the oldest city in Philippines but something had bring me to include the plan of having a way first to the one of the Philippines famous white beach; may be a hidden fantasy to our own paraiso. Planning way ahead of time pressured me to have everything listed in an itinerary in an intention of making this trip a perfect one and finally the time take me to my flight on board to see the Island of Boracay. It took less than an hour to arrive from manila; thanks that we made a safe way here. 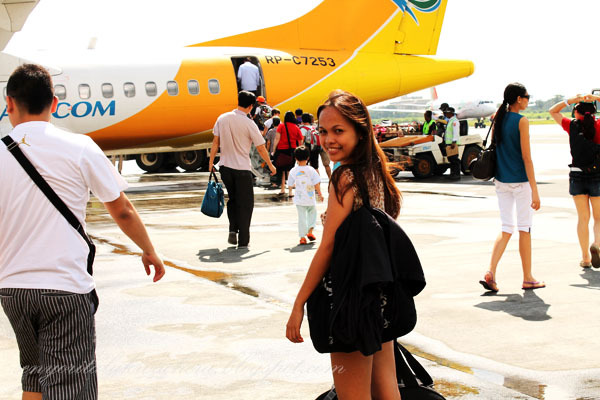 Now I have reached Boracay’s Airport – a very small yet welcoming one. We took the way to the right going to a tricycle terminal to a small Port, people were warm and helpful. I haven’t felt someone might be fooling around the tourist. I saw that people here were experts in hospitality like most of Filipinos do. A few minutes away from the Airport Is the jetty port – the way to the Island. When we entered the port the first thing that took my attention was this old guys playing guitar, they look so adorable in my eyes that I can't resist to take a photo before riding the boat. The 15 minute boat ride just gone so fast but still haven’t have much of a highlight yet, despite of sighting the white sea shore from a far; I am almost convinced that I am not really or totally enticed being here – that maybe it was only the flowery word that blew me away to this place. We took another ride to the hotel and a pleasing hotel entrance had welcomed us, the place was a beauty in silence giving us the thought of resting on that place. But it didn't went that way because our itinerary was broke that exact time that we spoke to the hotel staff. We had our booking dated incorrectly and was told that no room was available with the same rate that means we are on a cross road. It is our first time being here but fear is only in our mind – we are aware that somehow there will be a place that would cradle us; we just don’t know where that place would be. We decide to turn our back paying for additional cost and take our step looking for another place to stay – and we weren't wrong we found our haven next to that hotel. I was overwhelmed to surpass that time of hunting for place. After fixing our things and giving our back a quick lay on the bed next thing I knew was I am already standing next to one of the famous spot of Boracay. The famous shrine in stone the Willy’s Rock – and this was the exact time that I discovered a spot of me that fantasize this moment. I didn’t want to miss anything that day, we have walked a long way on shore savoring its wondrous view before heading our way to an outside mall located in the middle of the island, and there we found an affordable place to dine and shop something to take home. After enjoying a good food I usually want to lay down and sleep or watch some movies – a little couch potato. But that time it was totally different; I don’t want to miss a moment so right after filling our stomach we headed back to the beach. That time I realized that its more done swimming and white sand that make this place amazing. It’s the view, the smiles, and the exact ambiance that makes it to the fullest and because of these I totally forgot that I haven’t had a sleep or a nap for the past 24 hours. The sunset is making its most majestic way to exit the day. ill go on details in another post. After our dinner we chosed to take a walk back to where we stayed - at the rare side of station one. The long walk doesn't count that time because I enjoyed the night view so much. I love the lights of the lanterns , they look like reachable stars. I love dancing so much and for those who loves to dance too would surely wish to witness fire dancing in Boracay as it is the famous dance there! I am not expecting to see it that night because as I've read that fire dancing is performing at station two. Again as I've said a day of luck for me, the hotel before ours hosted a fire dancing show! So here they are, in front of me :) LIVE! The next morning was fantastic as we've seen it. I felt a wonderful feeling of gratitude and fulfillment, every second counts a memory of the waves and image of the pristine white sand that blankets its shoreline. This place was in deed our countries paradise. We have set to hop the island, but things again don’t go our way. A storm threatened the safety of Island hoppers so we made a last minute decision to roam the island targeting its heights spot by land via an ATV. Ting! An adventure ahead... I was excited and felt a little fear at my back. I know how to ride a bicycle but never had an experience in driving. We rock our way to Mount Luho and seen Boracays view from top. Happily; everything went well with the help of a kind guide. 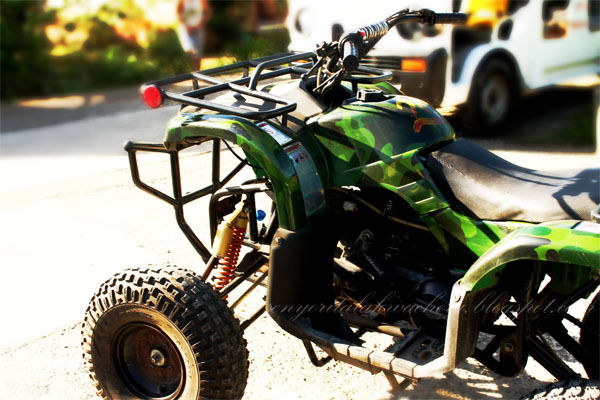 It brings our adrenaline to its highest level that make us crave for another exciting thing to do. So despite of a harsh waves we decided to head our way fifty to a hundred meters away from the Island to experience helmet diving and fish feeding. There is a doubt for safety at first due to huge waves and nasty wind caused by signal of a typhoon passing by – It made two from our group back out; but really having faith on the experts preceding the activity is a must and so I decided to go on. Though there is quite a difference on the regular visibility underwater I was still able to enjoy the feeling of being in some other world, so different and magnificent world under water. I love swimming but It’s not for me I guess as I’ve been wanting to learn it but knowledge and its application didn’t make it to my skills, hence I continue to love the water world and hates it when I am starting to feel cold. That time my body seems to adore the activity I didn’t felt any cold and that was surprising. After diving and walking we crave for coffee and so it's time for a shot of Real Coffee! That day make us so exhausted; but the astonishing sights never fails to heal the exhaustion running in our every veins and muscles. The time passed double the speed! We need to leave early tomorrow, we wanted to stay but we have to move on, to comfort our sad thought of leaving is believing that we will be back soon. If I had missed something that would be the sand castles. Its not a lost though, this little sand arts created by locals and mostly kids were enough. :) I love them and the little kids who did this, they are so talented and cute. woooow these are so great photos !! lovely pics. we were in bora last march and had a great time. can't seem to have enough of the sand-loving experience. would like to go back!